The Raspberry Pi isn’t exactly known for its polish. The glorious, but bare-bones $35 mini-PC packs humble hardware and even lacks a case in its quest to deliver affordable computing to the masses. That austere design even extended to the no-frills “Raspbian” Linux distro designed specifically for the Pi—until now. 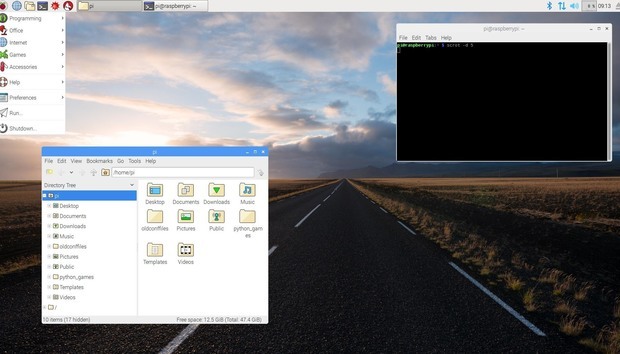 The Raspberry Pi Foundation just revealed “Pi Improved Xwindows Environment, Lightweight,” or Pixel, a beautified new desktop environment for the Raspbian OS. Pixel delivers a much-needed coat of fresh paint to the Raspberry Pi. Gone are the cryptic scrolling start-up messages, replaced by a simple splash screen. Gone is the stark Pi-logo wallpaper, replaced by your choice of 16 gorgeous photos captured by Foundation co-founder Greg Annandale. Even the window frames and login dialog box have been overhauled with a sleeker, more modern design. This is a top-to-bottom refresh of the Raspbian visual design, and it looks to be a huge quality of life improvement for Raspberry Pi aficionados. Be sure to check out the Raspberry Pi Foundation’s Pixel blog post for much more detail on every single design decision. The latest Raspbian image extends beyond Pixel’s amped-up aesthetics, though. The distro now includes RealVNC server and view applications by default, as well as a desktop Sense HAT emulator. The new Sense HAT application. The Raspbian image also introduces Chromium, which may eventually replace Epiphany as the Raspberry Pi’s primary web browser. Raspbian preloads Chromium with the uBlock Origin ad-blocker, to keep online advertisements from bogging down the mini-PC’s modest hardware. Likewise, Raspbian’s Chromium also utilizes the h264ify extension, which “forces YouTube to serve videos in a format which can be accelerated by the Pi’s hardware,” according to the Foundation. The impact on you at home: Pixel’s release won’t matter for Raspberry Pi users who use their machine for fantastical projects. But if you’re using the Pi as a basic computer, a tool to learn coding, or many other surprisingly practical projects, the new look will make navigating the mini-PC much more pleasant. With each new release of Raspbian and the Raspberry Pi itself, the Raspberry Pi Foundation does a stellar job of working out the device’s more annoying kinks.